In SQL Server Relational Database Management System (RDMS), we always try to create best Database Table design. 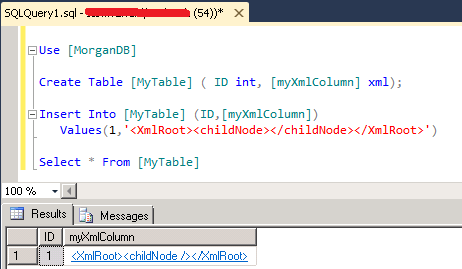 So we can easily avoid XML column by creating equivalent Table design. Querying XMl column by using XQuery will give performance overhead compared with normal T-SQL query. But in complex database design who have most dynamic need, we cannot avoid XML column. In this article, I am going write different examples to Insert XML Data into SQL Server Table using SSMS and .NET C# code. You can easily Insert XML data into SQL Table by using following SQL Insert query. If you have small size XML value, you can easily Insert XML data into SQL Table by using above SQL Query. But when it becomes large size XML file or XML data, it is very difficult and performance overhead to insert multiple XML records into SQL Table. In that case, we need go for alternative way. So we can use SQL Parameter approach to Insert Multiple XMl records into SQL table. Use the below example to Insert XML value into SQL Server Table using SQL Query itself without SQL Parameter. This method is recommended only for small size XML data and small number of rows insertions at the same time. How to read multiple XML files from folder and insert to table.